The ninth anniversary of the Yale Law Library Rare Books Blog is a fitting opportunity to mark a much more momentous anniversary, the centennial of the Mexican Constitution of 1917. Although amended a few hundred times, this constitution is still in effect today. It is among the most significant legacies of the Mexican Revolution. The Mexican Constitution of 1917 remains one of the most progressive constitutional and legislative documents of the 20th century. It created a minimum wage, the right to strike, and an eight-hour work day decades before the United States adopted similar laws. It also implemented a strict separation of church and state, land reforms, and term limits for the president and legislators. The Rare Book Collection recently acquired a superb collection of over 60 titles relating to the Mexican Constitution of 1917. Included are several early printings, such as this one published in San Antonio, Texas, a city that served as a refuge for Mexican political exiles during the revolution. 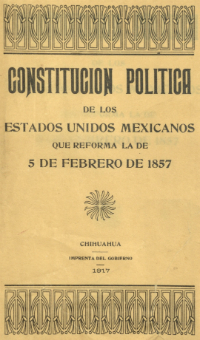 Following the adoption of the Constitution of 1917, there was a flurry of constitution-making in Mexican states, such as the constitution of Yucatán. “The Mexican Revolution and the United States in the Collections of the Library of Congress: The Constitution of 1917,” from the Library of Congress. “Centenario, 1917-2017: Constitución Pólitica de los Estados Unidos Mexicanos,” a resource-rich website (in Spanish) produced by the Government of Mexico. “Mexican Constitution (1917),” a post on Crisis and Achievement, a world history blog.